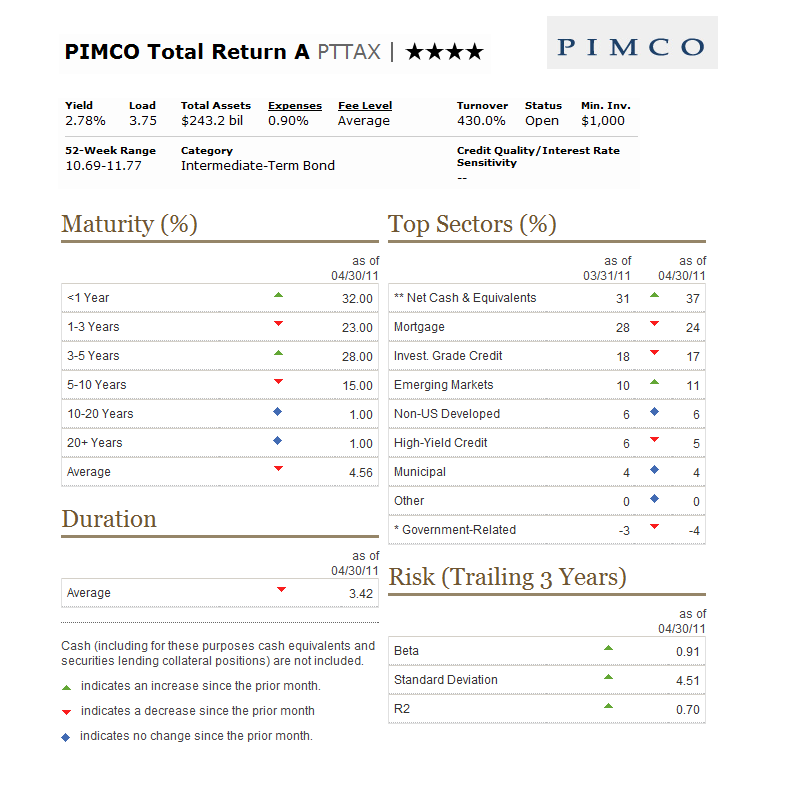 PIMCO Total Return A (PTTAX) is one of the best taxable bond mutual funds. This PIMCO intermediate term bond fund provides income to investors. As the top popular mutual fund in 2010, PIMCO Total Return fund has been the best rated fund in bond category. 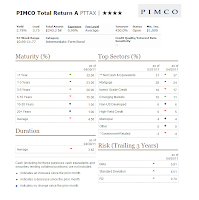 PIMCO Total Return also received 4 stars rating from Morningstar. This intermediate term bond fund objective is seeking maximum total return, consistent with capital preservation and prudent investment management. The fund usually invests most of total assets (>65%)in a diversified portfolio of Fixed-Income Instruments of varying maturities, which may be represented by forwards or derivatives such as options, futures contracts, or swap agreements. It invests in investment-grade debt securities, but may invest >10% of total assets in high-yield securities (junk bonds). William H Gross, also known as Bill Gross, was the fund’s manager before. Bill Gross has left PIMCO. He is a well known bond guru in investing world especially in Fixed Income area. He has received Morningstar Fixed-Income Manager of the Year Award for 1998, 2000 and 2007. Recently, he was named Morningstar Fixed-Income Manager of the Decade for 2000-2009. This PTRAX also has expense ratio of 0.90% per year. As part of load fund, it charges 3.75% front end sales load. To invest in this bond fund, you will need $1,000 or more initial investment. It also has a dividend yield of 2.73%. This dividend is distributed monthly. The fund has total net assets of $240 billion. The fund turnover is 430%. The current average duration is 3.42 years. There are various classes for this bond fund whether it is for individual investor or institutional investors. Some may provide better expense ratio and / or no load etc. You can also find this PIMCO fund in most 401K fund selection. In my current 401k account, I can choose PIMCO Total Return with PTTRX ticker. This PTTRX fund doesn't have any front end sales load. This means I don't have to pay any load when my monthly 401k contribution is invested in this fund. Other tickers of Pimco Total Return funds are: PTTBX, PTTCX, PTTDX, PMBIX, PTSAX, PTRAX, and PRFAX. As of May 2011, the fund top sectors are net cash & equivalent (37%), mortgage (24%), investment grade credit (17%), emerging markets (11%), non US developed (6%), high yield credit (5%), municipal (4%), and government related (-4%). Disclosure: I have small position in PTTRX in my 401k. Benefit of bond investment can be enormous during economic crisis. It can provide regular income and less volatility to your portfolio. Usually, the bond value will only decrease a little bit compare to stock or equity value. Bond also can provide instant portfolio diversification for long term investor. Among conservative investor and retiree, bond has been the bread and butter tools to withstand economic crisis. Depending your conform level; you can adjust your asset diversification accordingly. Rule of thumb is to have about 0-70% bond in your portfolio. The easiest way to diversify in bond is by investing in bond mutual fund. The following PIMCO Total Return has been the constant feature in any recommended funds by advisor or analyst. Note: PIMCO is an acronym for The Pacific Investment Management Company, LLC.